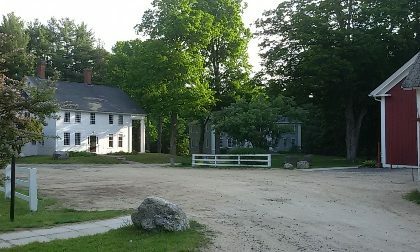 I should have written this blog post before the one regarding my trip to New Hampshire, but it slipped my mind until I stumbled across the photos on my cell phone. 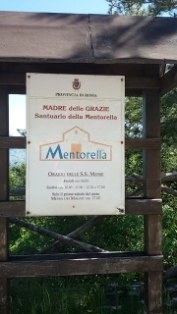 During the month of May my community did our annual Marian pilgrimage to the the Shrine of Our Lady of Mentorella. The site of the shrine has a history going back to the second century when St. Eustachius converted to Christianity there and was later martyred. The emperor Constantine decided to build a basilica there in honor of St. Eustachius and it was consecrated by Pope Sylvester I sometime before 335 A.D. 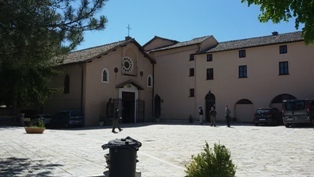 In the sixth century the property was given to the Benedictine monks of Subiaco and some scholars believe it was one of the twelve abbeys founded by St. Benedict himself. In the thirteenth century a wooden statue of Our Lady that sits in the shrine even today was created. The Benedictines abandoned the shrine in the fourteenth century and it fell into disrepair until the seventeenth century when a Jesuit, Fr. Athanasius Kircher, rebuilt the shrine and restored devotion to Our Lady of Mentorella. When he died he asked that his heart be buried there, and Pope Innocent XIII asked the same for himself. In 1857 it was entrusted to the Congregation of the Resurrection, who own and care for it today. 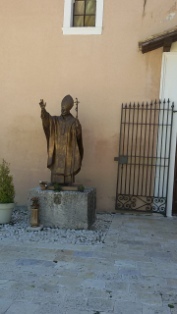 St. John Paul II visited it often (it is cared for by Polish priests), and Pope Benedict XVI visited it in 2006. 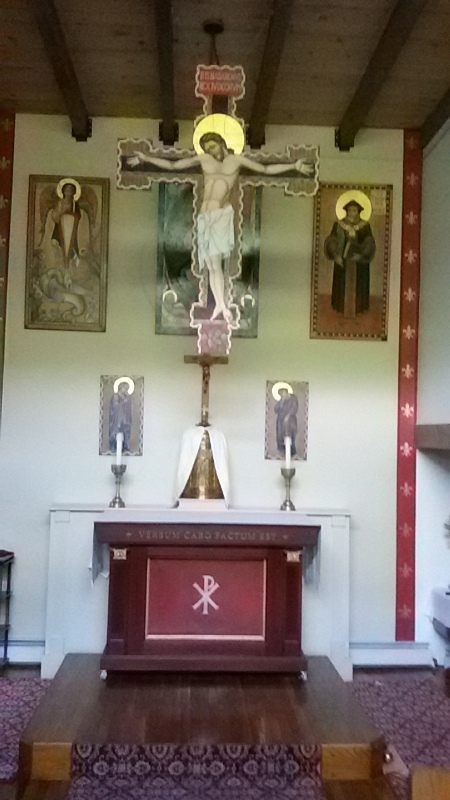 We arrived late morning and had a concelebrated Mass with homily in the tiny shrine (we all managed to fit in the sanctuary for the concelebration, but it was tight). After Mass there was time for hiking in the mountains and hills surrounding the shrine (the shrine is up in the mountains in the area of Capranica Prenestina, a thousand meters above sea level). The Resurrection fathers were gracious enough to let us barbecue in a beautiful little cultivated terrace where they have cookouts. After lunch we chatted and played table games for a while before returning to Rome after honoring Our Lady and enjoying some majestic views. In the last week of May and first days of June I was blessed with the opportunity to participate in a Fides et Ratio seminar organized by the Faith and Reason Institute. 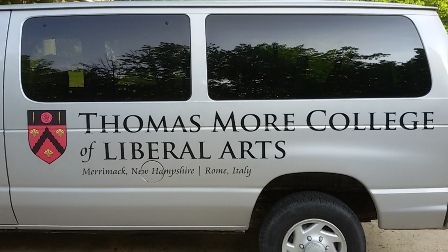 This seminar was held at the Thomas More College of Liberal Arts in Merrimack, New Hampshire. 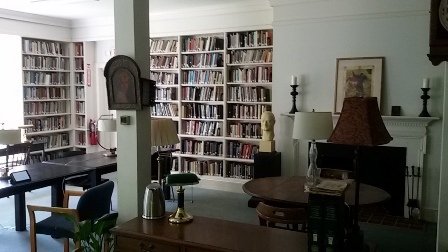 The goal of the seminar is to give Catholic educators an opportunity to study and discuss great authors of the Catholic Intellectual and Spiritual Tradition. The topic for the seminar I’d be attending was “The Church Fathers, Doctors, Popes, Sacred Art & Music I” and I hope to attend the second one next year. 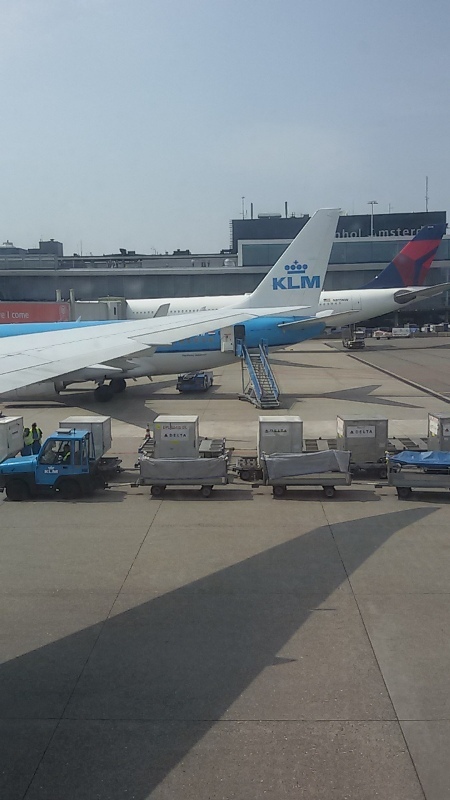 My flight connected through Amsterdam (a first time there for me and it is a nice, clean airport) and then I arrived in Boston, just a little over an hour’s drive away from Merrimack. 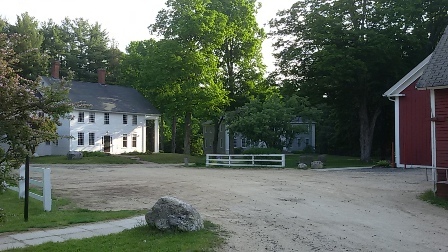 It was the first time I’d been in New England since 2014, when I spent the summer in Rhode Island to finish my doctoral dissertation, and it was nice to be back in the States, even if only for about a week. I made it to Merrimack from the airport without incident, and celebrated my return to America with some Chinese takeout thanks to the help of Ethan, an intern organizing the event. 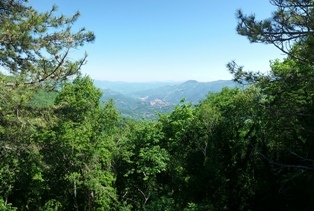 I’d arrived a day early to get over the jet lag and read a little more to prepare for the seminar. 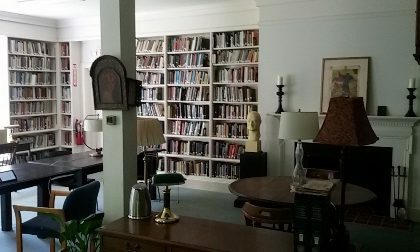 I spent Saturday reading St. Augustine’s On Christian Doctrine, my first read, and it was nice to have hours of quiet study in a faculty lounge (I am a professor). 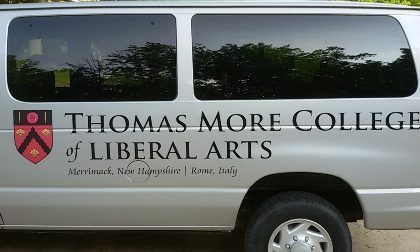 The college is small, about ninety students, and they have a four-year liberal arts curriculum. The students were on summer vacation already, with the exception of around eight or so who had jobs on campus during the summer. We had an excellent selection of readings. Church Fathers from the East and the West, including St. Athanasius and St. Augustine, Medieval authors, like St. Anselm and St. Bernard of Clairvaux, authors of modern spiritual theology, including St. Teresa of Jesus and St. Francis de Sales, and more recent popes, including St. John Paul II and Pope Benedict XVI. Other than two high school teachers and one doctoral candidate, the rest were university professors and the wealth of knowledge present made for some very enriching discussions. I also served as chaplain with daily Mass and time for confessions. On the Solemnity of the Sacred Heart of Jesus the students prepared some polyphony to sing. 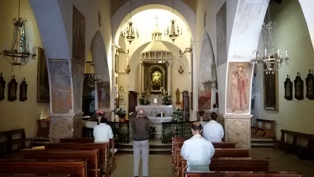 It was the tenth anniversary of my diaconate ordination and the World Day of Prayer for the Sanctification of Priests, so I thanked all those present, since a priest sanctifies himself through performing his ministry, so by participating in Mass we were helping to sanctify each other. The next day the seminar concluded in the morning and it was time to return to Rome after a wonderful academic and pastoral experience.